How to do box braids at home? Bedhead is a hassle we all have to face each morning, and no one likes getting up early to make their hair look great every day. 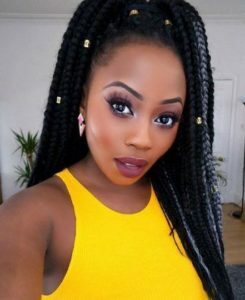 Box braids have become a huge trend right now, and this hairstyle is known, not only for a great protective style, but also a great hairstyle that can stay in place for weeks at a time. 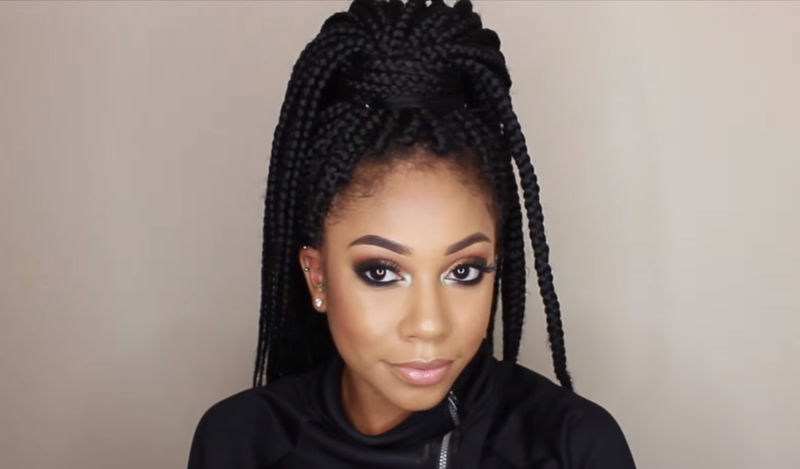 Lucky for you, this How to do box braids tutorial will teach you how to get this amazing style, so you can sleep in longer without worrying about your hair. 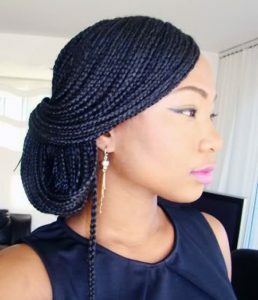 Step 1: Before starting your braid, make sure you have washed your hair with shampoo and conditioner. 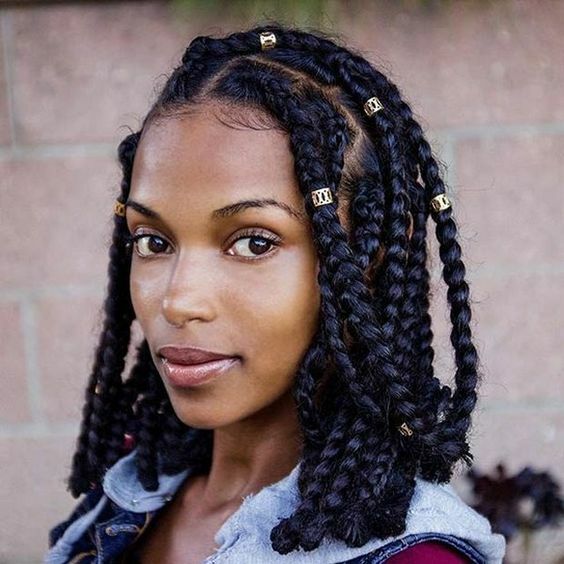 Using conditioner is super important since your hair needs moisture to support the braids. Step 2: Dry and detangle your hair from root to tip. Hair can become tangled and matted when you remove the braids if you do not do this step. Step 3: Divide your hair into four square sections and use clips to keep the sections in place. An example of the hair section are two sections in the back and two section in the front for both sides. Step 4: Choose a section to start on and part hair. Once you have parted your hair, get a small pinch of hair and braid it from root to tip. Step 5: After you finish your first braid, make another part in that section and repeat step 4. Step 6: After finishing that section, move on to the next one and repeat steps 4 and 5. Step 7: Once you finish braiding all your sections, you should have a beautiful hairstyle. 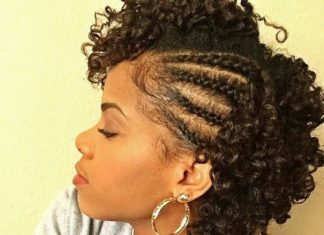 It takes a long to do this hairstyle. Make sure you have the time to do this, whether you do this at home or at a salon. If you are using hair extensions, make sure you add these extensions to your hair during step 4. If you feel like you need to tie your braids at the end, you can buy rubber bands at any store. But don’t tie rubber bands too tightly at the end as it can damage your hair. Don’t braid your hair too tightly as super tight braids will damage your hair. Also if you are getting this look done at the salon, make sure to communicate with your stylist if you think he or she are doing your braids too tightly. If you are adding your own hair extensions at home, make sure to soak the extensions in vinegar (apple cider vinegar recommended) before use. This will help you avoid any irritation the hair extension might cause. 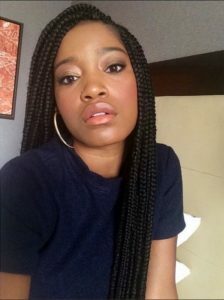 3How to Maintain Box Braids? Wash your scalp with a shampoo and conditioner concoction. Also run this mixture on your braids. To condition, put a lot of conditioner on your hair and the braids gently. Put your hair in a loose bun and put a shower cap or two on top for about 15 minutes. Rinse thoroughly once the 15 minutes are up. 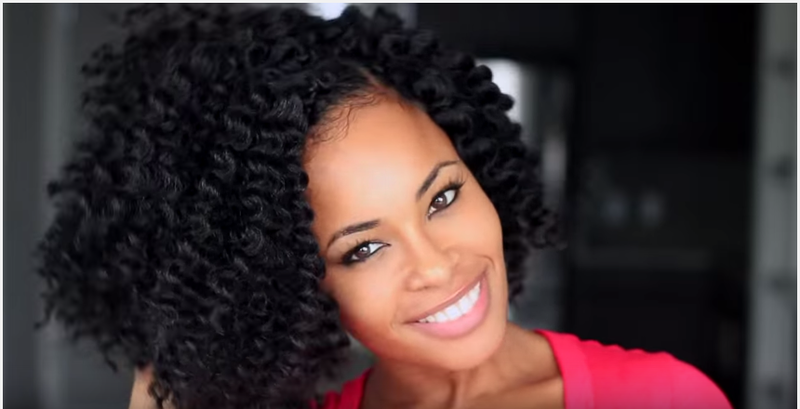 Make sure you dry your hair right away as this hairstyle is extremely heavy when wet. 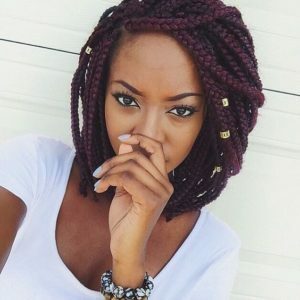 To keep your braids looking nice and tidy, you should sleep with your hair wrapped up in a scarf, preferably a silk one. 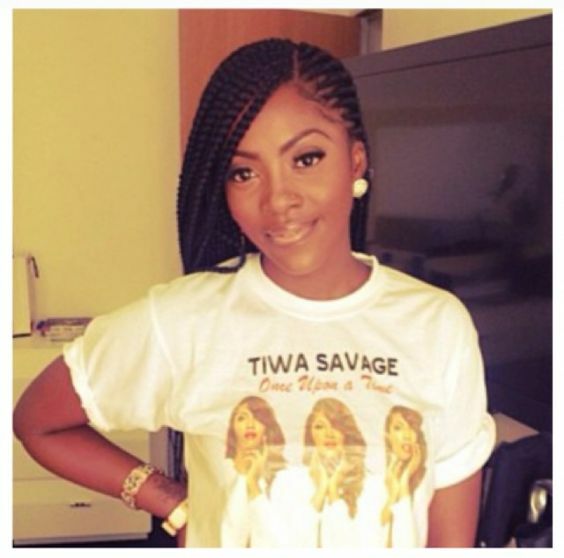 Remember to take your braids out after two months to avoid seriously damaging your hair. When you take out your braids, use your fingers to unwind them. 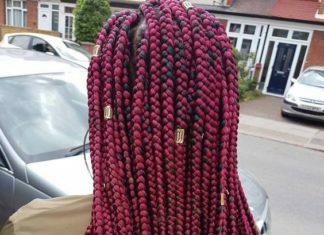 If you want really thick box braids, be sure to talk to a stylist beforehand as braids that are too thick can cause your hair to break. Kanekalon hair is synthetic fibers that is used for hair extensions. 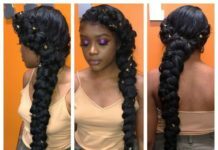 These hair extensions are used for box braids. An interesting thing about this hair is that it is flame retardant and hot-water set. People recommend that you talk to your stylist about the hot-water set. There two types of kanekalon hair. There is kanekalon used for full volume, and Afrelle for a slim style. There are many brands that produce and sell kanekalon hair. Xpression is a popular brand of Kanekalon hair, and many claim that this is the best synthetic hair in the market. There many stores and websites that carry this brand of kanekalon hair. However, prices vary for each website and store. There is an Xpression product for every type of box braid. For example, if you want tiny box braids, there are Xpression products made to for tiny box braids that are available in different colors. Many people who have reviewed Xpression products online have noted that you will need more than one pack if you have a lot of hair. However, Xpression hair is generally 82” long. 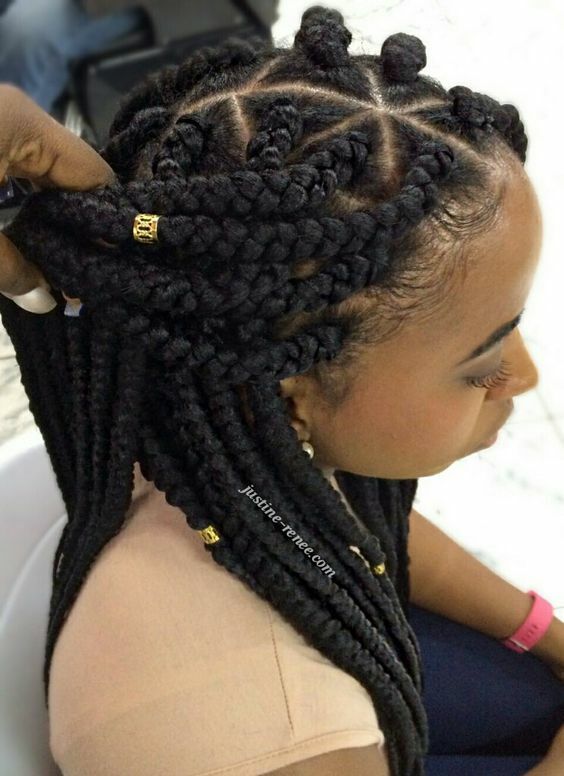 Your natural hair thickness and the desire thickness of your box braids will decide how many packs you need. On Amazon, there are many sellers that sell jumbo size Xpression hair. Because it is popular, many of these sellers sell out very quickly. You may have to look around Amazon to see if there are any sellers that sell the color you want for your hair. 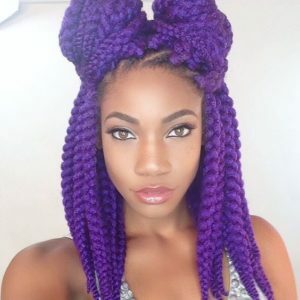 However, a regular pack of xpression can work for making big box braids, but you will have to buy more than one pack. As one pack will not contain enough hair to make big braids. 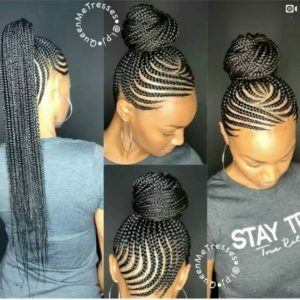 If you want to buy some Xpression type hair for your braids, you can buy some here. 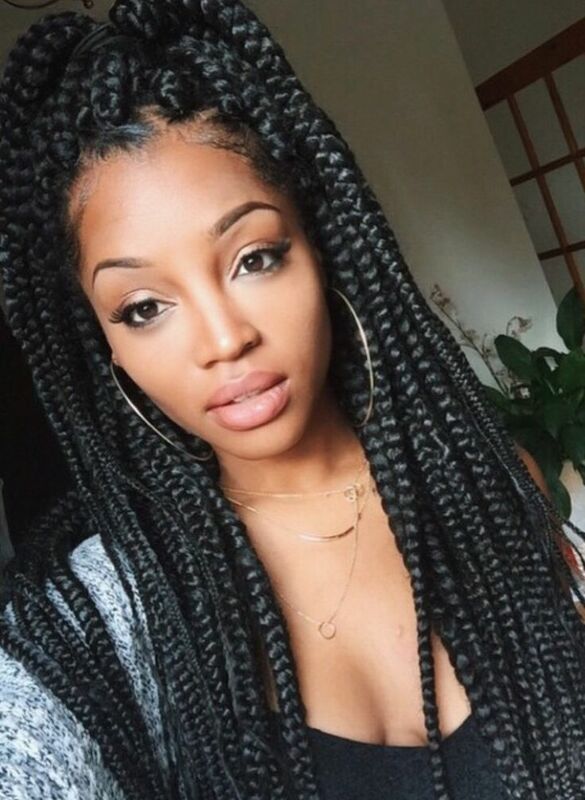 Remember if you want big box braids you have to buy more than one pack. 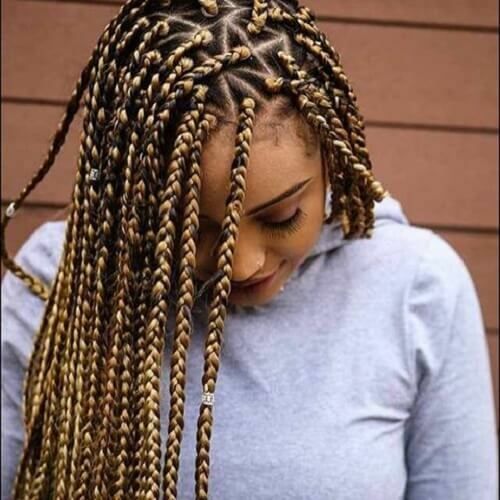 You can find Xpression products in this Amazon Link and remember that you have to buy more than one pack for medium size box braids with this brand. *There are other kanekalon brands that will probably have the color you are looking for if there is not Xpression product available in your preferred color. Like the jumbo Xpression products, the short hair extensions tend to sell out really quickly. You can find short box braids on Amazon. 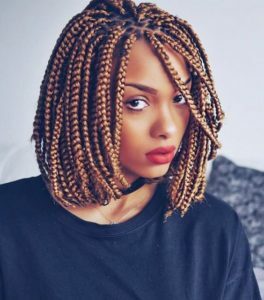 If you can’t find Xpression hair, you can try another brand that makes hair that will work for short box braids. For those who would rather use Xpression, you can buy one pack of Xpression for your and cut the strands to fit your hair length. Although if you have really thick hair you might want to buy two packs. You can find a link to a general Xpression search on Amazon in the previous section. 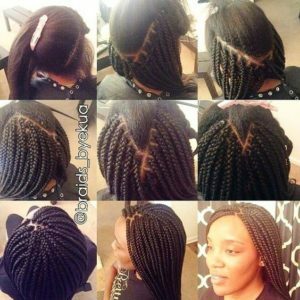 Now you know how to make, take care, and buy kanekalon hair for box braids. Now you can see 15 different ways that you can style your hair. Make yourself look like royalty with an elegant side bun. Whether you have a low or high bun, make yourself look regal with this look. 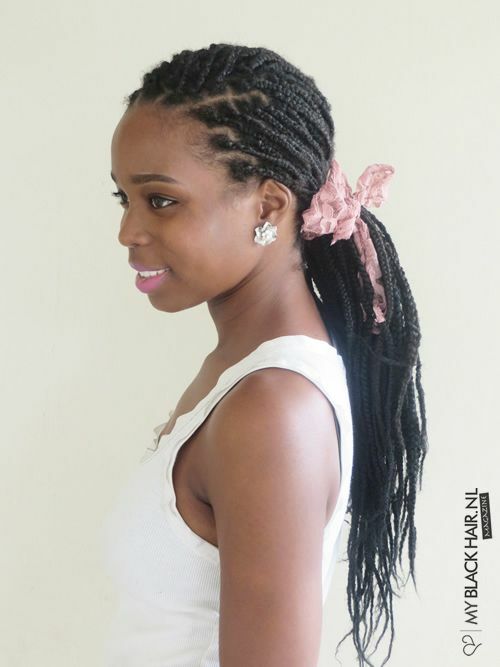 This is one of the easiest styles to do as you just twist and pin your hair until the bun looks elegant. When you thought that the ombre trend was finally dead, it came back and better than ever. This look draws attention to your hair and it makes a bold statement. You can see why as ombre usually uses a color that is lighter than your hair. So having your hair pink at the bottom makes you stand out. Figuring out a perfect hairstyle for summer weddings is hard. Lucky for you, a crown braid is easy to do, and it’s perfect for all the summer wedding you’re attending. For a half crown like the one shown above, take 1-2 inches of hair beside your ear and braid. Pull each braid back and secure with a bobby pin. While it may seem boring and basic, a low ponytail is one of the most versatile hairstyles out there. Hit the gym or night out with your friends in a low ponytail. You can tie your hair back with cute scarfs, ribbons, or regular old ponytail holders. 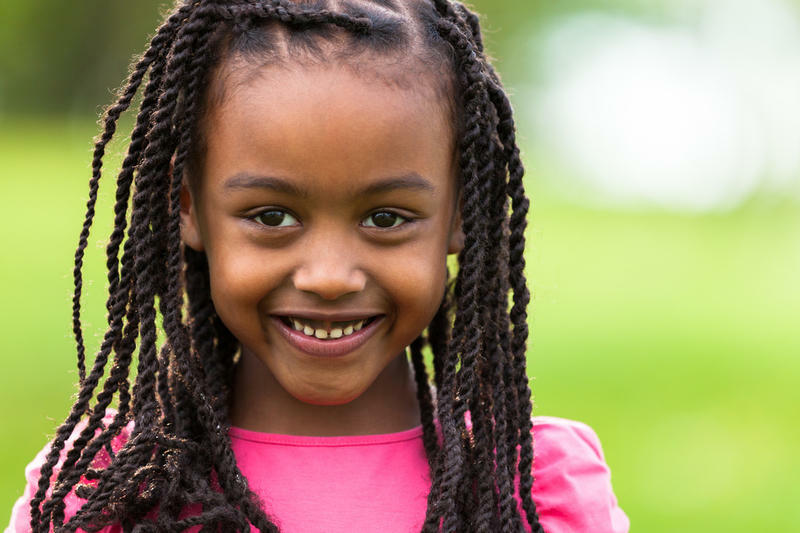 Get in touch with your inner child by putting your hair in pigtails. There are many ways you can style your pigtails. You can wrap hair around the hair elastic like shown in the picutre above. Also you can use colorful or printed ponytail holders to make a basic hairstyle interesting. 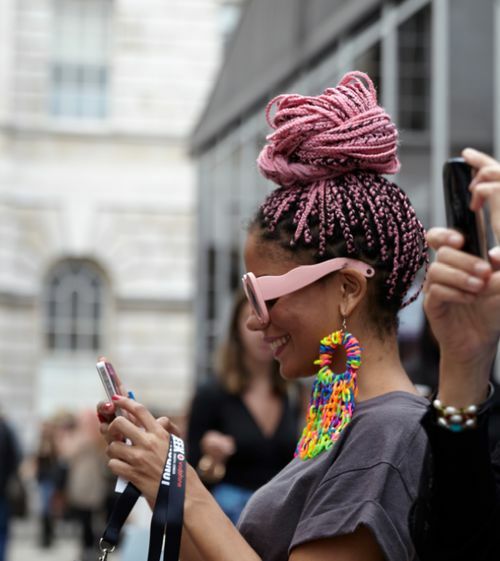 There are many bright vibrant colors for you to choose from, however, pink braids are one of the hotest trends this season. 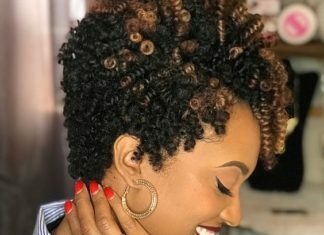 There are many different ways to achieve this look. 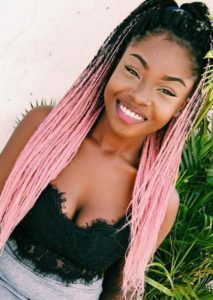 You can go to a salon and get your hair dyed pink since the color might not show up if you use an at-home hair coloring kit. Bobs are one of the most simple and basic haircuts. 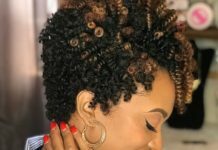 While you can wear you bob in a very simple manner, you can also spice things up by using the crochet braiding method like the one in the picture. 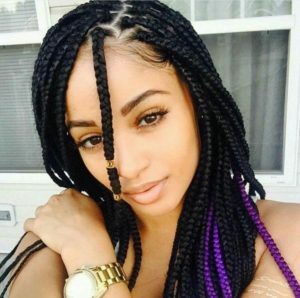 French braids are always a cute and fun hairstyle choice. 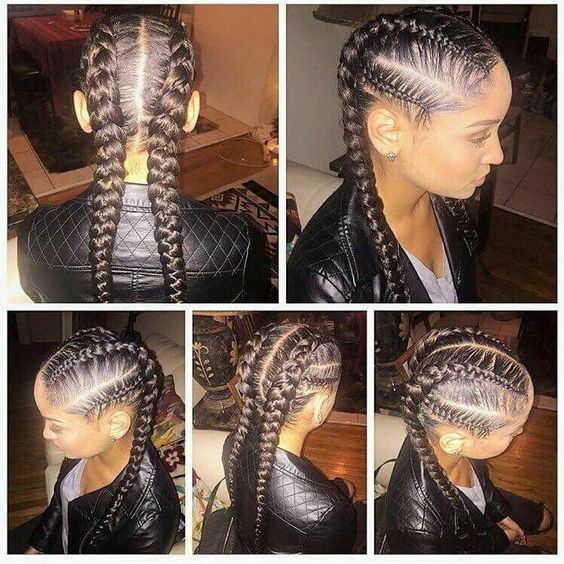 Like the photo above shows, there many different ways to braid your hair. 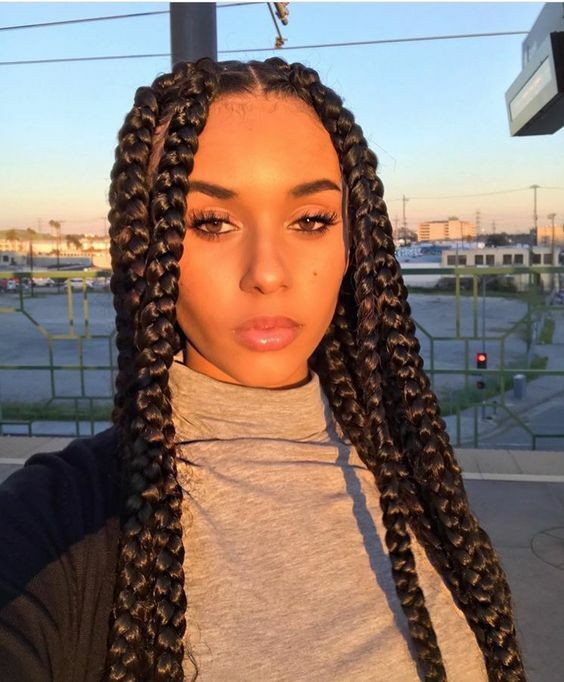 You can twin braids with braiding on the sides like the picture shows instead of a basic single braid. Grey or silver colors creates a daring stylish look. 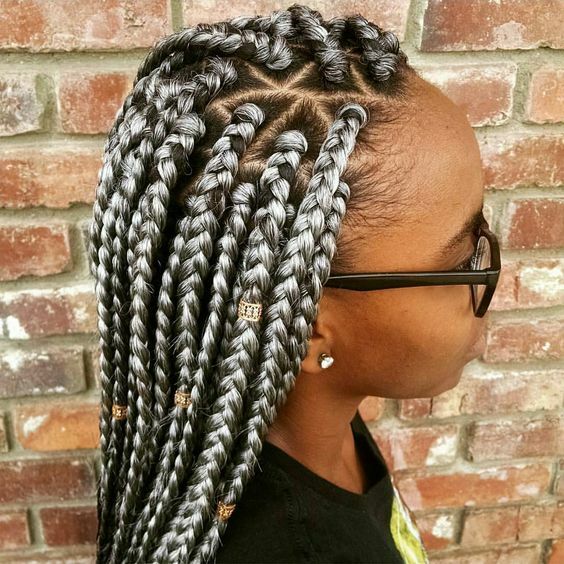 These box braids give an interesting take on this color. 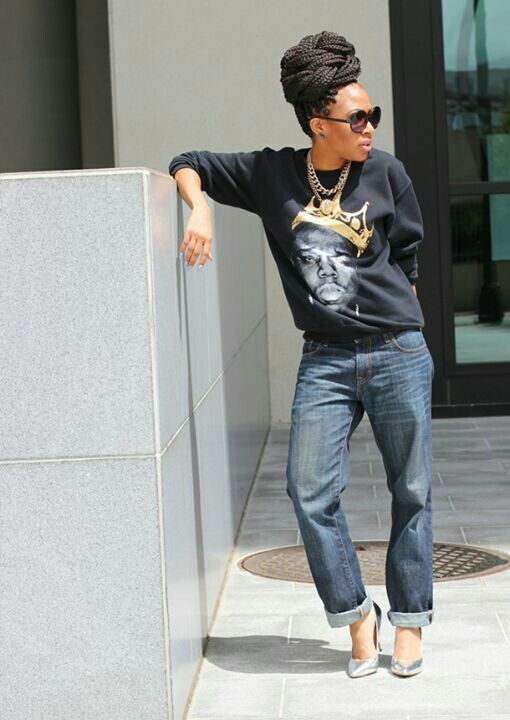 This casual look is perfect for many situations, whether it is the gym or a night out on the town. There are many ways to wear a high ponytail. You can have a high volume ponytail like the one show in the picture. You can add cute accessories to your ponytail like wrapping a scarf around the elastic band that hold up your hair to get a retro look. You can even go super ‘90s by using a scrunchie instead of an elastic band to hold up your hair. Double buns are a fun and unique way to show off your box braids. 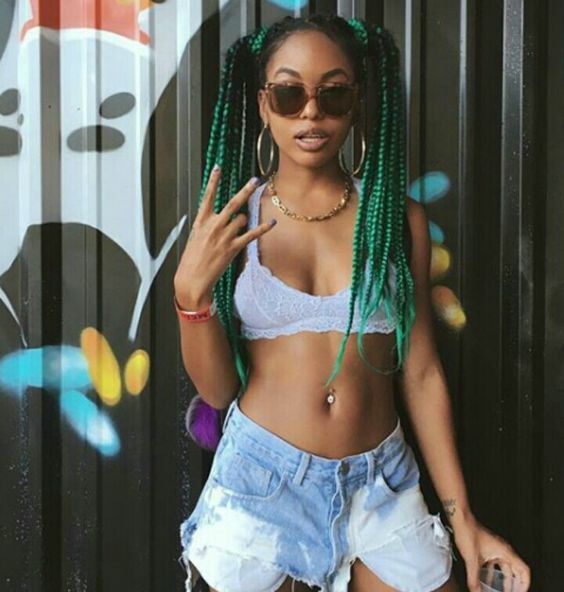 You can wear your buns like the picture shown to perfect a ‘90s vibe. Another way to wear double buns is to emulate Princess Leah and wear two buns at the side of your head. 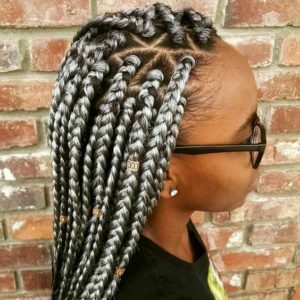 Highlights are a great way to style box braids. You can get highlights in any color whether you go in a natural color like shown in the picture or a bold color like blue. 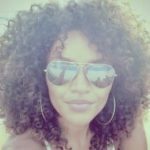 Having your hair parted in multiple directions shows off your highlights as your hair becomes the focus point of your features. Head wraps are a great accessory to box braids as it gives you a classic look. 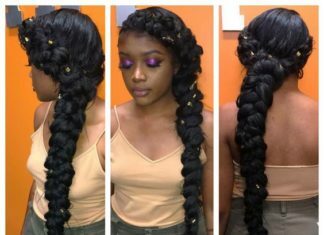 There are many ways to wrap your hair in this style. You can wear a cute turban like the picture above. You can also wrap your hair in a bandanna if you want a retro 1940s look like Rosie the Riveter. 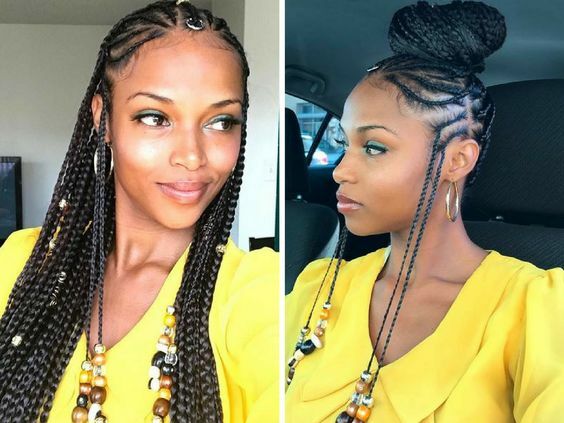 A casual protective style that’s great for a day at the office or a night out! A side part is a great and easy way to style your box braids as it always looks very elegant. Another interesting way to wear your part is to give yourself cornrows on the side where you made the part, like in the picture.